Mapleshade has helped countless customers upgrade their audio and home theater systems using their Vibration Control System. Use Mapleshade’s air-dried maple Platforms to isolate your gear from the distorting resonances that flimsy MDF-and-hollow-tubing equipment racks fail to eliminate. Introduced in 2002, Mapleshade’s SAMSON racks were specifically designed to improve the sound of any music or home cinema system. Despite the natural beauty of the handcrafted Ambrosian Maple shelves, SAMSON is not merely good looking A/V furniture. 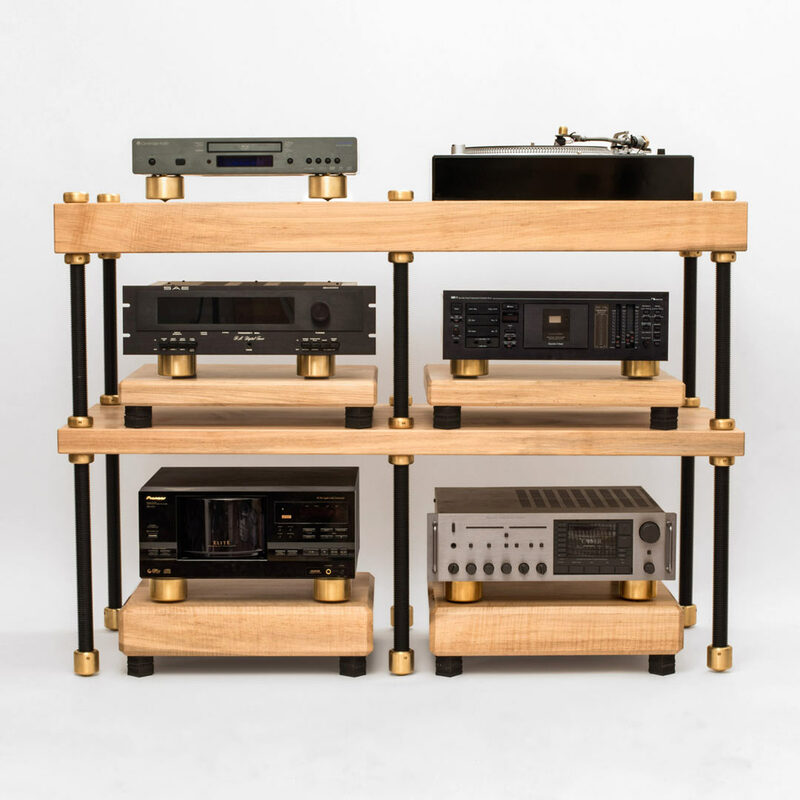 Each 2″ or 4″ air-dried maple shelf is rigidly locked between custom-machined, solid brass nuts that are threaded onto massive, 1″ solid steel uprights, then anchored to the floor via threaded-on brass footers. This creates the most direct, rigid and resonance free vibration-draining path of any equipment rack available today. Mapleshade’s SAMSON Vibration Control System sounds better than the most exotic welded tubing, damped layer composite, or inlaid hardwood racks. Besides its virtues as eye and ear candy, SAMSON is also designed to be versatile and adaptable. Shelves are available with a clear lacquer finish that beautifully enhances the striking natural grain character of the Ambrosian Maple. Mapleshade also offers a variety of toned finishes. The nickel-silver or black plated uprights accent the polished brass shelf hardware and footers, powder coat finishes are also offered. Infinitely adjustable shelves accommodate equipment changes. See Mapleshade at Command Performance today!